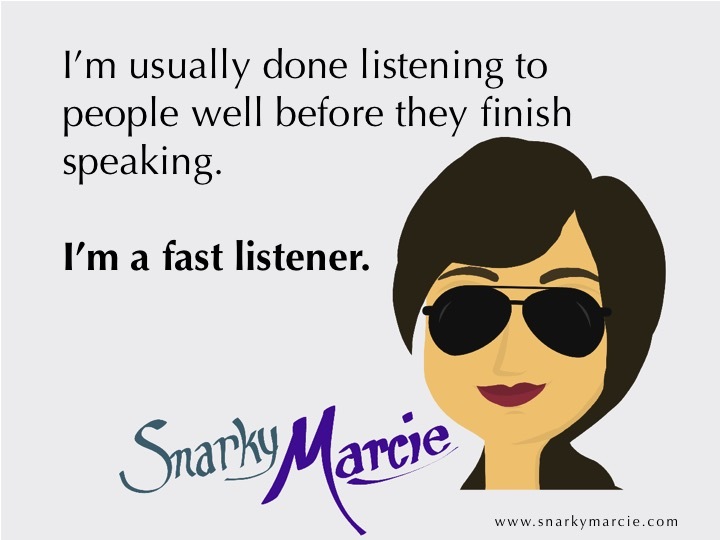 Snarky Marcie: Communicating with children. My niece is an energetic 4-year-old that has a lot to say. She used to be much quieter, resorting to yes and no as her main communication tools. Lately, she has been making up for lost time. Every time I see her, there is a new selection of stories she will tell. And, if it was a particularly big event in her life...she will continue telling the story for months. If you asked, she'd probably still claim that she has a 'new bed', over a year later. The difficulty with communicating with her is the length of the stories and the clarity of speech. I've seen other parents and siblings translate children speech, and I always thought it came with being close to a child. Well, let me clue you in...if you don't know already. No one is really listening. This happens with children and adults, alike. 5. They do the nod and smile. We've all done it, to children and adults. It's semi-polite behavior, if you can pull it off. The 'nod and smile'. Be sure not to tilt your head or let an eye-roll slip out. Keep a straight face, make eye contact, and nod and smile. Oh, and make sure your smile isn't too large and your nod isn't overzealous. Less is more in this arena. Also, don't get rhythmic with your nod, because then you're clearly head bobbing to the song in your head. This kind of behavior may work with children, but it's a giveaway with adults. It's best to keep the same level of quality with all audiences. 4. They give vague responses. Give vague, and I mean vague, responses. This isn't a time and place for yes and no. You're not answering any questions or validating the story. Keep it simple, stupid. There is the uh huh, and the I see. You can also use oh, and really? Mix it up. This is another area where less is more. 3. They encourage the speaker to share their news. Use your polite little responses and wait until the story is over. Then, say a simple phrase with a modicum of enthusiasm. Whoa, you know who would love that story? Go tell [insert name of nearest third-party]. If you get any poor feedback from the third-party, be sure to appeal to their emotions. You want your child, friend, family member to share their lives with them. It may not seem important, but it was important to them and you want to encourage them. #AintNobodySeeingThroughThat. 2. They defer any questions. If at the end of a long story, you tune into a question...you may find yourself with a slight panic, having not listened to a word they said and knowing not what the question is referring to. No worries. Defer the question. If there is another person capable of answered the question (spouse, grandparent, FedEx guy), then toss them the ball as soon as possible. If it's all on you, give yourself more time. Tell them you need to think about it. Whenever you say 'let me think about it', it's a no. 1. They hold onto a few key words. Pay attention long enough to pull a few meaningful words or phrases out and then hang onto them. If you hear someones name or the color of a dress, keep thinking about them until the story is done and then include them in a simple response. Trust me, I've used this with my fashion-inclined friends. It works. 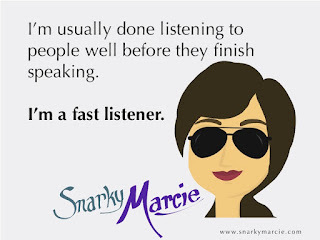 There are many other tools you can use to fake listening, but these are key. The truth is, we should all take a break from our own universe and humble ourselves to listen to one another. I get it, it's the umpteenth time you've heard this story because they can't remember telling you. Is a few minutes listening to a story really going to kill you? If you really listen, you don't need tools to show you're listening.